Pop-Up Greenhouse for Tomatoes: Is It for You? A pop-up greenhouse is an ideal alternative to a traditional attached or freestanding structure, particularly for the home gardener or gardening hobbyist. It is collapsible and movable, providing temporary, seasonal protection that can be used year after year. Pop-ups, also called “mini-greenhouses,” come in a range of sizes. One of their main benefits is convenience. You can set up one when you need it and then take it down and pack it away when you’re done with it. In contrast, a typical greenhouse is much more permanent – not to mention a more significant cost investment. In addition, you can set up a mini anywhere you like – even in the smallest space. This allows you to take advantage of sunlight positioning. You can even use it for overnight or frost protection for plants that are already set out in the garden. They are available in all shapes, sizes, and types. Like other greenhouses, pop-ups can extend your growing season. 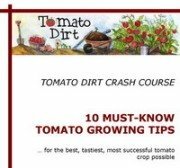 You can use them to start tomato seeds, rather than starting them indoors. You can also protect tomato seedlings in a pop-up when you set them out to harden off, use a mini to propagate cuttings, and even set plants inside them to overwinter when fall comes. A pop-up lets in more light and acts as a greenhouse. In contrast, most frost cover protective pop-up structures do not have clear sides. Heater. Set a small space heater in your pop-up overnight during frosty weather to keep temperatures consistent. Fan. Use a portable fan inside the pop-up to keep air moving around. This can help strengthen tomato stems, encourage pollination, and prevent fungus, damping-off, and mildew. Convenience. 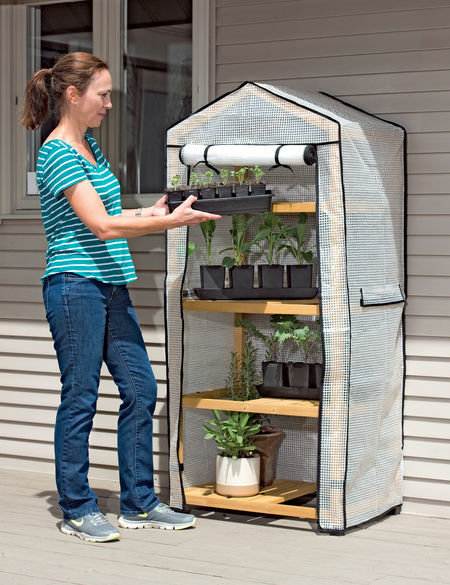 A pop-up greenhouse is easy to set up and can be disassembled, collapsed, and stored over the winter. Cost. Pop-ups are considerably less expensive than traditional freestanding and attached greenhouses. Plus, since they are smaller, they don’t need their own heating, cooling, and watering systems. Versatility. Pop-ups are available in different sizes. Mobility. Because they’re collapsible, pop-ups can easily be moved from one place to another. Impermanence. Pop-ups are not a permanent addition to your home and can be stored in the off-season. Size. As in so many cases, one gardener’s advantage is another’s disadvantage. This is most definitely the case with a pop-up’s size. This kind of greenhouse may not be for you if you need considerable space in which to grow tomato seedlings (and other seedlings) or if you plan to harden off a large number of plants. If more than one of the following is true for you, then you may want to consider a pop-up or mini greenhouse. You need temporary greenhouse space in the spring and/or fall. You are short on garden space. You would like an easy or portable way to protect plants from frost. You would like a simple way to overwinter plants.